AURA2 RGB lighting which was built ahead of many competitors, the SHIELD DC(Double Capacity) DDR4. Co-developed with ASUS ROG team, it amazingly supports small form factor motherboards of Intel Z390 including ROG MAXIMUS XI APEX, MAXIMUS XI GENE, and ROG STRIX Z390-I Gaming. With the whole new architecture, it achieves not only double capacity of 32GB for single slot, but also high frequency of 3600MHz with impressive stability. Such a widely praised high-end memory module in the PC world comes along once in a lifetime. 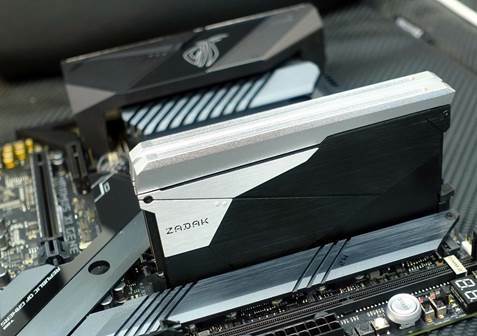 In 2018 ZADAK takes the biggest leap since the original DDR4. SHIELD DC DDR4 comes with double capacity of 32GB for one single stick. The IC dies for SHIELD DC DDR4 were meticulously screened that one IC was chosen out of 10 thousand ICs. ZADAK adopts the whole new architecture with special circuit design on PCB offering double capacity as well as incredible stability under high speed operation. The unprecedented design and functionality of the SHIELD DC DDR4 breaks the limits of inadequate memory on the two-slot platforms. For content creators, 3A gamers, and those gamers who prefer a compact PC for space-saving, ZADAK SHIELD DC DDR4 gives you the double capacity, double speed, and double enjoyment. The SHIELD DC DDR4 fully supports the latest ASUS ROG Z390 motherboards. It starts at a clock speed of 3000MHz, going up to 3200MHz at a voltage of 1.35V with CL14-14-14-34 and 3600MHz. It comes with single channel packaging as well as kit of dual-channel one with the highest capacity of 64GB (32GBX2). The RGB lighting of SHIELD DC DDR4 is synchronized with ROG AURA2 so users can regulate the preferable colors and manage the LED flashing patterns.